By late 2009, it was clear that Democrats had a problem. Some generic congressional ballot tests were showing Republicans with a seven-point lead, which would have been consistent with a 1994-style blowout. But analysts were nevertheless deeply divided over whether Republicans would even be able to take over the House, much less replicate 1994. Some argued that demographic change had insulated Democrats. Because of the growth of the non-white electorate, even if the Democratic share of the white vote fell to the 42% share (subtracting third parties) they received in 1994, Democrats would barely lose the national popular vote. This was a serious, credible argument. But in November 2010, Democrats won only 38% of the white vote. Taking into account exit polls, the National Election Study and historic popular vote totals, it was probably the worst showing among whites, at least as presently defined, for any major party dating back to 1822. Two years later, in a more favorable environment, Democrats still managed only 40% of the white vote. This led me to wonder if white voters were trending away from Democrats over time. After examining a variety of data, I concluded that there was a shift from Democrats among white voters, and that we might reasonably conclude that this trend will continue in the future. This was published as part of a four–part series at RealClearPolitics. Last week, Alan Abramowitz and Ruy Teixeira published a thoughtful rebuttal to part two of the series, which discussed trends among white voters. I think these arguments miss the mark, and I thank Professor Sabato and the Crystal Ball team for giving me a chance to respond. Before beginning, we should clarify my thesis. It has never been, as some have suggested, that the GOP should “double down” on white voters while writing off non-whites. The pieces have simply observed that there are problems with the suggestion that the fate of the two-party system hinges on Republicans passing a specific piece of legislation (immigration reform) in hopes of encouraging 10% (up two points in the last eight years) of the electorate to move toward the Republicans. To win in 2012, the GOP could have tried to improve its share of this Hispanic vote by 21 points. But we have to understand that the same result can be achieved if the Democratic share of the white vote declines further by three points. Far from encouraging the GOP to select a particular path, the series simply lays out multiple options for the GOP. Each of them contemplates some improvement with at least one minority group, as well as some shift of the GOP agenda. The best scenario, described in part three, actually involves modest outreach to all groups, majority and minority alike. The gravamen of Abramowitz and Teixeira’s complaint is I examined trends in white voters’ Partisan Voting Index (PVI) to determine whether the white vote was moving away from Democrats. They observe that PVI is an inherently relative measurement. Therefore, we might also say that the white vote is staying constant, but the Democrats’ share of the electorate is increasing, making whites look relatively more conservative. These debates are inherent to PVI. Reagan carried Massachusetts twice, but PVI calls it a solidly Democratic state in 1980 and 1984. PVI also describes the Bay State as moving leftward from 1980 to 1984, even as Reagan’s numbers there improved. We could credibly argue that the composition of the rest of the country simply became Republican faster than did Massachusetts, and that both really evinced a rightward trend. It seems clear to me that Massachusetts was not really a swing state at its core in the 1980s, but you could argue it the other way. Regardless, while PVI always has “chicken-or-the-egg” issues, I used it in part two of the series because it is both simple and intuitive. It is a straightforward way to try to remove national effects, allowing us to compare dissimilar elections. More importantly, it’s more appropriate for reaching the broad audience we draw at RealClearPolitics than a more technical regression analysis. Most importantly, it is hardly the only data that supports my conclusion (and it is worth noting that even Teixeira and Abramowitz’s regression finds a statistically significant trend toward Republicans among whites). But rather than using PVI to allow us to compare apples and oranges, let’s try to compare apples directly. We could try to find and compare other years where Republicans fared about as well with the white vote as they did in 2012. Teixeira and Abramowitz identify one such year: 1988, when Michael Dukakis lost the white vote by the same margin as Barack Obama. This is actually evidence that whites have trended away from Democrats, all other things being equal. The 1988 elections were held in a horrible environment for Jackson’s Party. GDP growth was around four percent, the Republican incumbent — while not on the ballot — was popular, and the Democratic challenger was weak. In 2012, the environment wasn’t quite reversed, but it was much better for Democrats. The Democratic president’s job approval was more-or-less even, and he was running with growth at his back, however tepid. Many economic models used by political scientists suggested an Obama reelection. That Democrats now win the same share of the white vote in slightly favorable environments as they once did in terrible environments suggests that whites have, all other things being equal, moved away from the Democrats. Or, to put things a little differently, in 1996 and 2008, Bill Clinton and Obama both won by similar margins in quite favorable environments. But Obama did nine points worse among whites than did Clinton, despite the substantially similar environment. Party identification ebbs and flows in predictable response to national events, but basically does so around the same midpoints. 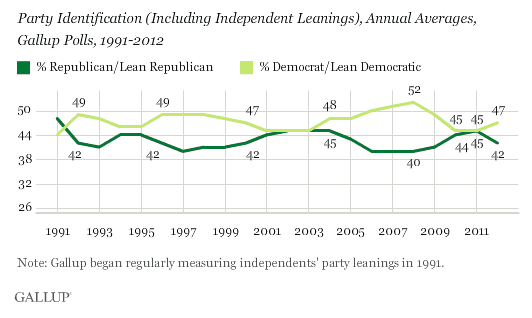 Unlike Gallup, Pew doesn’t push “leaners.” It finds fewer Republicans than in recent years, but also finds more independents. This is most likely because Republicans increasingly self-identify as independents; this, you may recall, led to the unfortunate “unskewed polls” phenomenon of 2012, as well as to Romney’s unusually high margin with independents for a losing candidate. Most importantly, contrary to what we’d expect if the white vote were constant, Pew doesn’t find more Democrats. Of course, the best approach is probably to use a regression analysis. Abramowitz and Teixeira attempt this by comparing the Republicans’ share of the white vote against a time-series variable. Almost none of the variation is explained. I’d expect nothing more. Indeed, it would be shocking if a simple two-variable regression showed whites becoming more Republican over time. That would suggest that the movement of the white vote away from Democrats was so inexorable as to trump all outside considerations: the economy, incumbents’ job approval, wars going badly and everything else. Since whites are responsible for some 80% of the variance in the overall presidential dataset, such a finding would upend a lot of political science analysis. A better approach is the one I undertook in part four: seeing whether there is a statistically significant relationship between the Republican share of the white vote and the progression of time after controlling for other factors. I actually used Abramowitz’s data for his original Time for Change model, examining presidential approval ratings, GDP growth, incumbency and the year in which the election was held. You can read my piece for a more thorough exploration of the methodology and findings, but it turns out that there is a statistically significant relationship between the time variable and the Republicans’ share of the white vote (p=.01, b=.73). None of this should be surprising. Whites have become more prosperous over the past 50 years, and income still correlates with Republican voting habits (for Hispanics, non-Hispanic whites and, to a lesser extent, African Americans). Moreover, Democrats’ decision to embrace policies aimed at their “coalition of the ascendant” cannot be viewed in a vacuum. A case in point is Arizona, a state where Mitt Romney ran about as well as George W. Bush, despite a less favorable national environment. The Hispanic vote there has grown and, given a state GOP that stands as a poster child for how not to attract Hispanic voters, has moved sharply toward Democrats. But the Democrats’ stance on immigration isn’t particularly popular among whites, and whites, especially whites without college degrees, have shifted toward Republicans, resulting in no net change. The bottom line is that political scientists have been reasonably successful at predicting elections based on a few basic factors. None of them, to my knowledge, includes a demographic variable. If the only relevant demographic change were the growth in the non-white vote, we’d expect these models to take on a pro-Republican bias over time, as a pro-Democratic variable that the models fail to account takes on increased salience. But models like Nate Silver’s famous FiveThirtyEight model, the Hill/Sides/Vavreck model and many others called the election pretty well, without reference to demographic changes. Brendan Nyhan has helpfully collected graphs showing how models have performed since 1976, and if anything there’s a persistent bias toward the incumbent party, not toward Republicans. There’s no gradual deterioration of their ability to predict races. The original Time for Change model had its best result in quite some time. It’s because the growth in the non-white vote has been offset by a deterioration in Democrats’ standing among whites. Any one of these observations, standing alone, would stand as reasonable evidence that the Democrats have been shedding white voters over time. Combined, they’re pretty compelling. The Democrats are reaping the benefits of our increased diversity. But they’re paying it back with an increasingly poor showing among whites. Sean Trende is Senior Elections Analyst for RealClearPolitics. He is a co-author of the 2014 Almanac of American Politics and author of The Lost Majority.